Enjoy exquisite dining at The Grange Restaurant, the award-winning restaurant at the Hilton Adelaide hotel, followed by cocktails in Charlies Bar. Catch a tram to seaside Glenelg from the doorstep of this city center hotel, adjacent to the Adelaide attractions like the Central Market. Relax on sun loungers by the outdoor swimming pool, wind down in the sauna, work out in the exercise room or enjoy a game of tennis. Located in the heart of the city, 10 minutes' drive from Adelaide Airport, the Hilton Adelaide hotel offers 17 meeting rooms for 2-800 people, a business center and an Executive Lounge. From Hilton Rooms to Deluxe Plus Rooms, all have high-speed internet access. 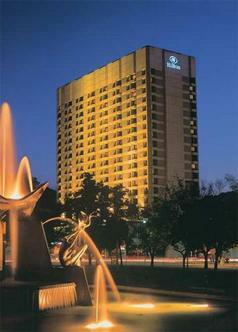 Hilton Adelaide hotel Executive Rooms offer Executive Lounge access.